As a recent dog owner, what becomes quite clear is not only the division between those who own dogs and those who don’t, but also the division between dog owners themselves. However, whether we find ourselves with a canine companion or not, there are some unspoken rules that we can all benefit from. That is, of course, in my humble opinion (which you’re all entitled to). 10. Jordy and I recently came across a man with his two dogs, one of which was a dachshund. Without warning, the dachshund lurched at Jordy, sending him into a tailspin and leaving me to quickly get my balance to avoid crushing Jordy after being tripped by the dachshund’s leash. Point being: keep your dog(s) under your control at all times for everyone’s safety. 9. If my 12-pound furball trots onto the elevator and you scream like a school girl, guess who looks like the moron. If you’re not fond of dogs, then believe me, there are plenty of apartment buildings in Vancouver that don’t allow them at all. 8. Get your dog spayed or neutered! All points of the globe are already over-run with a severely swollen population problem, so please don’t contribute to it by breeding your dog for a quick buck. You have zero control over what will happen to those puppies, and half will most likely end up dead or in shelters due to your irresponsibility. 7. Like humans, dogs have allergies and can be intolerant to some foods. Never give a dog treats or food without explicit permission of the owner first. The last thing we dog owners need is a $100 vet bill because you thought it would be cute to feed our dogs a bite of your lunch. 6. Invite good karma into your life and buy me this t-shirt. Size small, please. 5. Dogs will positively thrive when you provide a structured, disciplined and loving environment for them. Not only will it encourage their emotional health and well-being, it will also instill confidence in them for the times you’re not around. 4. 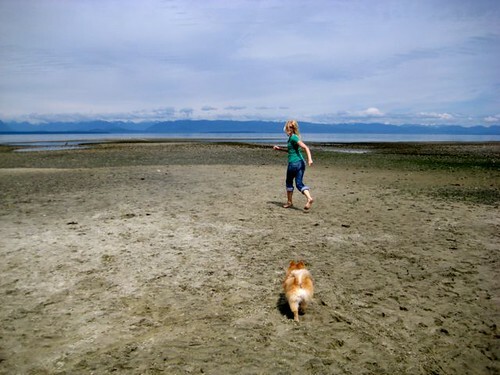 Both Vancouver and Vancouver Island are full of terrific off-leash spots for your dog. 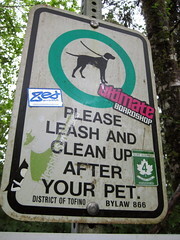 However, being off-leash is a privilege, not a right. If your dog’s misbehaving, show her who’s boss. 3. Ask first, pet later. I’d never walk up to your child and give him or her a hug, so please refrain from walking up to my dog and nuzzling or petting him without asking first. It’s intrusive and inappropriate. This is, of course, negated at dog parks where dog piles are an inevitability. 2. In the same vein, when walking your dog, make sure it’s okay to approach another dog before doing so. When an owner is trying to work with and train his or her dog to obey and “walk nicely,” your playful dog can be a huge distraction and derail the entire process. 1. Pick up the poop! Do I need to say it again? Pick up the poop! Leaving your dog’s poop on the sidewalk to smear, squish and rot in the sun is both disgusting from the standpoint of human decency, but also contravenes City of Vancouver by-laws. Pick up the poop! To all of you responsible dog owners out there, thank you! Both dogs and people are a part of every community, so it’s important to have an understanding both ways. If you have something else to contribute, please feel free to do so in the comments. And lastly, if you’re considering bringing a dog into your home, remember the rule of thumb: Adopt, Don’t Shop! I could not agree with these rules more! 10) It drives me insane when people do not control their dogs. There is a time and place for your dog to play and roughhouse, but when its a public place and your dog is running up to everything and everyone and attacking other dog it is NOT cool. 3) Our family dog is a bit of an ‘old man’ and does not like being touched by people he doesnt know, yet he is so cute that everyone wants to play with him. It frustrates me when I go for a walk with him and people come up to pet him because they have no idea if he is friendly or not and if he were to nip at them it would be my fault, when really they should have asked before coming up. Oh and question about number 6. If we wanted to get a specific type of dog and we wanted to get them at the puppy stage what would be our best options other then a breeder? I’m not sure if you’ve written a post about this yet or not (might be a good idea since you are so knowledgeable on the subject) but I am very curious what the best way to go about getting a puppy is. What are the downsides to breeders or ads in the paper? I am not opposed to getting a puppy from the SPCA, actually I would prefer it if I could, but how often to puppies actually become available, especially specific breeds? While it is unfair to say that all breeder are “bad,” the good ones are few and far between. Many, many breeders’ homes are simply staging areas, and the dogs are bred and kept elsewhere until they are ready to be sold. Dog breeding is first and foremost a business for the purpose of fulfilling consumer desires and making money – the wellbeing and health of the dogs is not of high concern. Also, very rarely is a screening process ever conducted to ensure that a dog is going to a home in which it will be well-loved and cared for. The same can be said of pet stores. Consider the concept of supply and demand… and the simple truth is that there are more dogs than there are homes that want them, so to purchase from a breeder is perpetuating a horrible problem rather than fixing the problem. In the process, countless dogs get left behind, and the ones that don’t end up in shelters end up neglected, homeless, starving and terribly ill. In fact, the U.S. destroys over 4,000,000 animals per year because there simply isn’t enough room for them in shelters. Instead, a quick Google search will help you find what you want. I know you’d mentioned a beagle in the past, and the great news is that many dog rescue societies specialize in particular breeds (check this and this out). Also, the SPCA shuts down puppy mills on a regular basis and their website is updated daily. It would be a good idea to contact them to let them know what you’re specifically looking for. Believe me: it is possible to get what you want and have the peace of mind knowing that you’re providing a great home for a dog who would otherwise be another sad story. And I promise you… there is no love like the love you receive from a dog who recognizes what you’ve done for him or her in rescuing them. Thank you Keira! I feel a lot better about this now! Good dog owner rules to live by! – Teach your kids good dog manners, if only for their safety. How many dog bites could be prevented if kids were taught appropriate behaviour around dogs, and supervised closely when they’re around them? – Don’t discriminate based on breed! Educate yourself about the myths and stereotypes associated with the various breeds of dog and don’t feel entitled to comment on things you’re ignorant about. – Little dogs should be trained with the same care and diligence as big dogs. Just as it’s not ok for a 100lb dog to bark its head off and lunge at the end of its leash at passers-by, it’s not ok for a 10lb dog to do that either. – Dogs belong with their family/pack, not outside on a chain or in a dog house. – When adopting, consider an adult dog. Many are “issue free”, and often it will take just as much work to train a puppy properly as it will to train an adult dog. Ok, I’ll stop there for now because obviously I have a lot of “pet” peeves…. I agree with all of them except number 3. If you find it intrusive and inappropriate then it sounds like you need to relax a little. People love dogs and it’s just natural for someone who likes dogs to quickly stroke them in passing. And in response to Smelly Danielly: If your dog nips or bits at people who pet him… he should wear a muzzle, end of story. My disagreement on that point aside, this is a great list of rules for dog owners and non dog owners alike. Good advice. @Dan – I have to politely disagree with you. While I can understand that people love dogs and the instinct to pet them is natural, when my dog and I are out for a walk, we are not a traveling petting zoo. Daily walks are a dog’s time to bond with his or her owner, spend quality time together, encourage his emotional well-being and provide disciplined (but fun) exercise for him. It’s me and my dog’s special time. When I first brought Jordy into my home, he suffered from high anxiety and anyone other than me made him incredibly uncomfortable and stressed. Strangers approaching him to pet him only exacerbated the problem. So unless you know a dog – and therefore his history and health – it’s not a good idea to assume it’s okay to pet the dog and go ahead doing so. 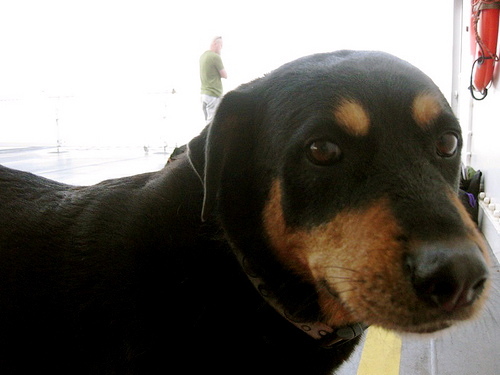 It takes two seconds to ask an owner whether or not it’s okay to pet their dog. First off, it’s a simply courtesy, and second will also ensure both the dog’s safety and your own. What i dont like is when we see people leave their doggie doo bags on the side of paths/trails. Why leave them bundled up where the plastic that they are kept in doesn’t decompose. People stick them in trees, on stumps, hanging on bushes. @Tyler – Yes! I just don’t get that mentality! I could never, ever let Jordy just poop somewhere and walk away. I can’t fathom it in the slightest. Good list, every dog owner should follow this. Can’t agree more about the don’t shop, adopt idea. Dogs are our best friends and they should also be maintained well. Dog owners should take care that the dog does not get itself into trouble. Good rules – easy to follow and I think it’s necessary.